The touchscreen text input space could be heading for some serious disruption. If Apple drops its API guard a little more to allow developers to create system global keyboards that could open the floodgates to real keyboard innovation on iOS. (I for one hope so.) That’s not to say novel keyboards aren’t already out there — they are — but uptake is limited on Apple’s mobile platform by how siloed these apps currently have to remain. There are now signs Apple is preparing to be a little more open on that score, which could give alternative keyboards some serious uplift. That limitation does not exist on Android, of course, where developers are free to replace the system keyboard with their own software. But the barrier to entry here — and generally — remains how accustomed people are to Qwerty layouts. Better the devil you know, especially if the newcomer is a new-fangled layout that looks confusing and initially makes texting much slower. (See, for instance, the Dvorak keyboard.) Little wonder that the likes of Swype have done well by disrupting the input method but leaving Qwerty order as it is. Cutting the link with the Qwerty past requires other, bigger stuff to happen with devices themselves. Yet there are signs those changes could be coming. Wearable technology is waiting in the wings to put new demands on text input technology. Sure you can talk to Google Glass but what if you want to send a message without dictating it to the room? And what about an Apple iWatch? A wrist-mounted screen is going to be highly space constrained — and no one wants to go back to the days of alphanumeric repeat-tap keypads. So it’s pretty clear there’s going to be pressure for keyboards to evolve, for layouts to get a lot more flexible to keep pace and fit the new places we want to put devices. The most striking change is already evident: gesture-based text input is helping to breakdown our old tappety-tap keyboard habits — with software like Swype and, more recently, a startup such as Minuum. But both still lean on the Qwerty layout, even if Minuum has squished the space it takes up. There are others that don’t though. Meet MessagEase: an alternative keyboard that uses a mixture of taps and gestures combined with a radically different keyboard layout designed to speed up text input by minimising the movements typists have to make to reach the keys. 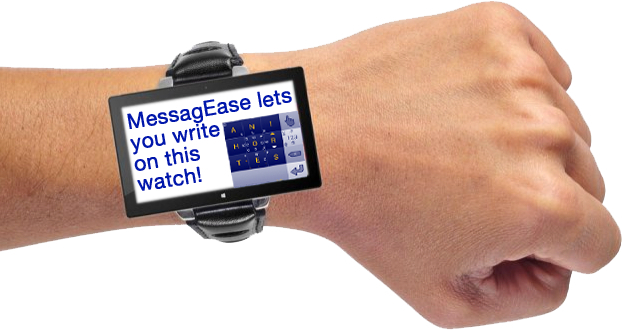 MessagEase’s method compacts the keyboard space required into a small square — which could easily fit on a wrist watch, say, or even enable a Glass wearer to type in the air with minimal finger movements, once they have the muscle memory to do so. The MessagEase keyboard software has been more than 10 years in the making — the earliest version was created for the now defunct Palm back in 2002 — but its creator, Saied Nesbat, reckons the technology landscape is finally starting to catch up with his idea. “MessagEase’s invention was inspired by a vision of the time when QWERTY would have to be abandoned. But 2001 was not that time, nor was 2005. I believe we are nearing that time as touch and gesture input become more pervasive,” he tells TechCrunch. Nesbat, who has a PhD in electrical engineering from Stanford where he specialised in Design For Test, says the keyboard’s design grew out of his frustration with texting on “old style cell phones” — so long before the rise of smartphones — but he also says he foresaw that small touchscreens were going to create a real pain-point for Qwerty. “So I set out to redesign the keyboard going to the basics,” he says. “I used my expertise in exhaustive testing, exhaustive simulation, and letter frequency statistical analysis (used in coding and encryption) to create a new, efficient letter assignment such that the finger movement is minimized and the speed is maximized (this is the same principle used for Dvorak keyboard). The other principle that I used was to reduce the number of keys to 9, arranging them in a 3×3 matrix, use drags in addition to taps, and make each key bigger. The analysis of this design using Fitts’ Law (the fundamental UI “law” that quantifies UI speed based on key sizes and distances) shows that this design achieves superior speeds. Plus, it enables entering up to 162 characters using only 9 keys!” he explains. The basic mechanism of the MessageEase keyboard involves taps for the most commonly used letters (ANIHORTES), which get pride of place on the grid to comply with Fitts’ Law, and then directional drags to reach the rest of the keys — either up, down, left, right, up left, up right, down left, down right and so on. “With these nine keys, you can enter ALL letters and about 80 special/punctuation characters,” notes Nesbat. Capitalisation is done by circling a letter or swiping up on the R key once or twice to lock caps lock on and reversing the gesture to return to lower case. Additional keyboard layouts that add in punctuation and numerals can be accessed by swiping up over the space bar or via a toggle key. The flexibility of the MessagEase keyboard extends to customising its language, shape and layout, plus the ability to create macros for particular word combinations — for example you could preset “td” to expand out to write “Today’s date is Sunday 2 June”. MessagEase’s keyboard software is available on Android, iOS, Windows, Pocket PC and Palm OS. The Android version of the app includes word prediction and the keyboard can be resized, reshaped, recoloured or made blank — Nesbat says the latter option is “for our advanced users who don’t need to see where the letters are; they find it distracting!”. Despite this software being a decade+ out in the wild, MessagEase clearly hasn’t stolen Qwerty’s crown yet. Nesbat says it’s had more than 500,000 downloads and has “tens of thousands of dedicated users now” — which just goes to show how hard it is to get people to change ingrained habits. Albeit, says Nesbat, that’s with “almost no money spent on marketing” — he therefore argues that MessagEase’s adoption rate is much stronger than other non-Qwerty input technologies such as Snapkeys and 8Pen. Of those MessageEasers that have put in the time to learn — getting fast (40-60 WPM) takes several days of practising 10-20mins per day, concedes Nesbat — a few are very fast indeed, with the current champion setting a world record typing speed equivalent to 84 WPM. Of course most users aren’t going to achieve anywhere near those speeds but with around 50 WPM being around the average speed of 10 finger typists using regular keyboards MessagEase’s method looks reasonably impressive — assuming you’re willing to put in the hours to reprogram your fingers. And there’s the rub really: reeducation of typing muscle memory remains the biggest barrier to any Qwerty killer. Setting aside its radical new layout, MessagEase’ most salient feature is how compact it is — allowing one or two fingered typing on very small screens — which, more so even than potential fast speeds, may be the USP that allows it to gain a foothold as screens shrink and morph to fit new physical locations. On the training side, to help new users get to grips with its grid, the company behind MessagEase, Exides, has created tutorials and built practice games into its keyboard apps to help users make the switch. That’s a start — but it’s still a steep learning curve to expect people to climb on their own. The imperative created by new types of devices may prove a more compelling climbing aid. Exideas is not currently profitable but it does have licensing deals in the works. “We have several licensing deals in the process, but none we can disclose now,” says Nesbat. “(One, more advanced one is re: Internet TV/ Set top box/ remote. )” He won’t disclose Exideas’ funding or backers but says it’s not currently looking for external capital. Since its apps are free to download to mobile platforms, licensing is clearly where it sees a profitable future for its patent-protected technology.